I don't like very much Twine, but this was very hilarious! Good! Thanks. Everything I've written up until now has been parser IF; this was an experiment to see what Twine is like. It's a very different sort of writing experience. I'd now like to do something longer format in twine and work on integrating more of a puzzle component (but for the most part, I'm sticking with parser). I have never had a job where I needed to present a PowerPoint, but now I know what to expect. I'll have my will ready beforehand. 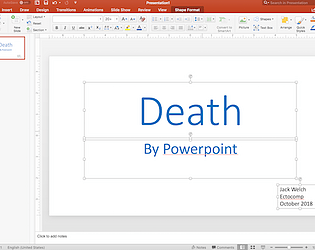 I assure you that this is an entirely typical experience for PowerPoint users. On the topic of Microsoft Products, I believe that Word has a template for Last Will and Testament that should serve. Really enjoyed this exploration of what's REALLY scary in life: public speaking and dying laptop batteries. The way the story unfurled, becoming increasingly surreal and macabre, was paced perfectly. I am maybe not the reader for this. I found things a little hard to follow, and couldn't quite get a grasp on the rules of the world I was in. The first ballroom scenario I picked, in particular, threw me for a loop. Once I got more used to that, I did enjoy the zany humour! Any suggestions to improve legibility? For some small bits of the game (the file directory and ending), I used custom fonts, but body of the game, I went with the browser-supplied sans-serif font. I could easily switch it out to a defined font. Hello again! I loaded this up in my browser, and it looks like it's actually using Impact, of all things, for the font... Perhaps my browser/computer doesn't have Futura? Although that seems unlikely, it's the only thing I can think of. Anyway, just thought I'd let you know! I started writing this at my hotel in Chicago the evening after my presentation, while it was all very fresh.